La Trobe Financial has established a real name for itself in recent years with its Commercial loan product range, but our Residential loan products have led La Trobe Financial’s success throughout the 60 years we have been in business. Through all that time La Trobe Financial has dedicated itself to long term residential loans meeting the needs of specialised or near-prime borrowers. In the last 10 years alone we have lent $5.0 billion to borrowers and this has primarily been long term residential loan products. Today our product range continues to target the consistent needs of our brokers and borrowers in residential near prime lending whilst regularly moving to meet the evolving needs of our customers. As always we lead our products with a Credit Team process designed for ease and speed of dealing for Brokers - optimising Brokers’ efficiency in providing product solutions to their customers. 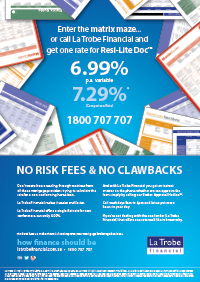 To add to these profiles, La Trobe Financial does not charge a Risk Fee and has no Clawback Fees. Our specialised product range also extends beyond these market leading products – our personalised and highly experienced underwriting process and our diversified funding allow us to say yes to specialised proposals that meet and reach beyond typical residential offerings. Often we also find success is the result of providing “one extra” required product characteristic that, in combination with the remaining profile, beats the market. La Trobe Financial both meets the market on common products and truly differentiates beyond to be a sole solution provider. Through our flexible product range and emphasis on speed of dealing, La Trobe Financial successfully settles major loan volumes for a regular clientele of Brokers and Mortgage Managers. If you have a need that you think we may be missing please discuss it with us and see if we can respond; our Credit Analyst Team is trained and empowered to provide you prompt answers on many potential scenarios. If you haven’t had the opportunity to try our Residential product range then you are missing one of Australia’s leading exponents of specialised long term residential lending. 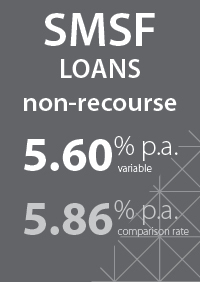 We find that typically new referring partners, after a number of dealing experiences, make specific comment to us on the ‘can do’ helpfulness of our staff and the ease in taking a loan from referral all the way to settlement. This is our benchmark objective and the root of our success in a relationship based industry. 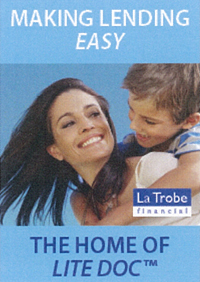 "La Trobe exemplifies exactly what a specialist lender should be. They don't just take another bank or lender's funding and policies and rebadge them, they are not another "me too" lender. They really have a point of difference with their policies and service and Connective is proud to be associated with La Trobe and its wonderful people." 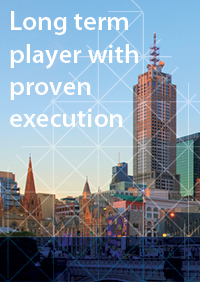 We are presently in the process of making sure we talk directly to a lot more of Australia’s brokers, reinforcing our leading product profile and would be delighted to have the opportunity to meet your residential lending solution requirements. To discuss your needs please contact our dedicated Sales Team direct on 1800 707 707, or contact our state based Distribution Team members, profiled in this Newsletter.